The BEST Home Builders in Lakewood Ranch, FL. The place owner Jeff Earl of Foundation Masters, LLC calls home! Lakewood Ranch is one of Manatee County’s nicest upscale communities, and also voted in the top 10 most desirable places to live in the United States. It’s community offers FINE shopping, dining and recreation. The famous family friendly Anna Maria Island and Siesta Key Beach are both just a short drive away. Founded & established in 1995, Lakewood Ranch is a families dream community. You’ll find nine villages, from town-homes to custom estates. The 18,000-acre Lakewood Ranch also provides much entertainment at Main Street with retail shopping, office space and gourmet and family-friendly restaurants. The Lakewood Ranch community has the best schools, rare, unique shops and boutiques of all types, and lets not forget the beautiful golf courses. If you love the out door, bring your walking shoes, with more than 150 miles of paved & non paved trails, community parks, lakes and nature preserves. Lakewood Ranch is also designated as the largest green-certified community in the United States. Half of the land at Lakewood Ranch is set aside as open or recreational space. Foundation Masters, LLC has teamed up with one of the BEST Home builders in Lakewood Ranch. 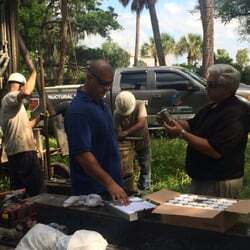 Foundation Masters, LLC is the #1 Civil Engineering Company in Florida specializing in Foundation and Structural Repairs, we want to share our Structural design knowledge with our community to build you a safer home. Foundation Masters, LLC want to provide our community with the safest living environments possible for your family. Foundation Masters, LLC will provide for FREE GPR scanning all new construction sites for sinkhole, soil subsidence and poor soils that will cause settlement cracks in your home. This scanning is called Deep ground penetrating radar underground scanning surveys are conducted with a low frequency GPR antenna, such as a 200-MHz antenna that can reach depths of up to 35 feet in sandy soils. Applications for deep ground penetrating radar include landfill and burial trench delineation, geology and bedrock depth studies, and karst and sinkhole location.